However, addressng journalists, Rivers State Police Commissioner, Francis Odesanya said the two security agencies were at the scene because they received privileged information. He declared that their reckless action portends danger to the nation's democracy, noting that he is convinced that President Buhari is not aware of the level of impunity being perpetrated by Federal Securiy agencies. According to him: "Not under my watch wiĺl I allow this kind of impunity to take place. That is why we are here. I don't know which judge they were detailed to abduct. I didn't bother myself to know which judge. All I am interested in is that, at this level, it is not allowed. "He is not a criminal and he is not an armed robber. If the person has committed an offence, invite him. It is only when he refuses to honour the invitation that you can adopt this commando style. "The Commissioner of Police is here, the Director of DSS is here. Their operatives cocked their guns and threatened to shoot me. I have never seen that before. Again , this is to tell you what we are facing . We know that more will come. For us in this state, we shall continue to resist it." 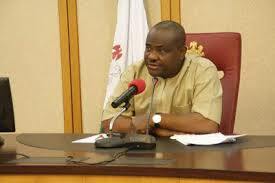 Governor Wike added: "It doesn't matter what it will cost. When you talk about liberty, sacrifices must be made. We are not trying to stop an arrest. All we are saying is that things must be done decently and in line with the rule of law. "Rivers State is under siege. For you to see a governor out at this time of the day, something is wrong. A siege is an understatement. If this type of thing happens next time, the people wiĺl resist it to the last". The governor stressed: "They are trying to do something funny in this state, probably to declare a state of emergency.